Postgraduates Diploma in Taxation Laws. Postgraduates Diploma in Intellectual Property Laws. 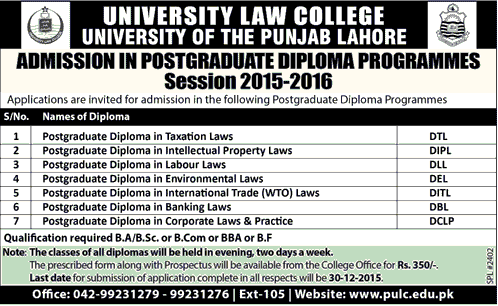 Postgraduates Diploma in Labour Laws. Postgraduates Diploma in Environment Laws. Postgraduates Diploma in International Trade (WTO) Laws. Postgraduates Diploma in Banking Laws. Postgraduates Diploma in Corporate Laws & Practice. Item Reviewed: University of Law College Admission Postgraduates Diploma Programmes 2016 9 out of 10 based on 10 ratings. 9 user reviews.